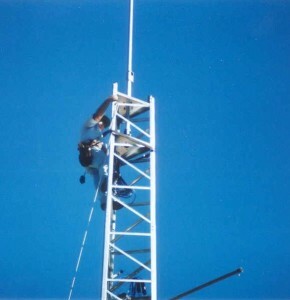 Welcome to the N0RQ/N5SUE Tower Project page! 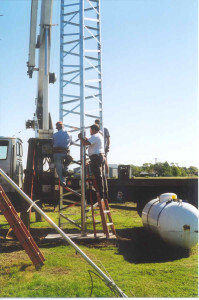 Though we had a small 30′ Rohn 25 that held a 2m vertical and the TV antenna, we decided (in 2002) to put up a real tower that would hold some antennas of size. 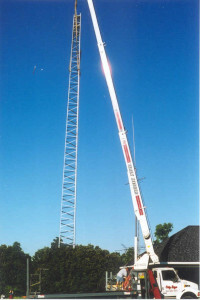 We picked a Trylon Titan T600 – 64′ tall. One big advantage is no guy wires (which made the xYL happy!). We hope you enjoy the following info, and if you’re putting up a Trylon (or similar), there might be a few tips that you find helpful. First and foremost, we want to express a big thank you to the many folks who helped us on this! 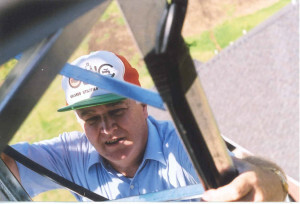 Mike W8CM — tower-elmer and tower-climber — what would we have done without you??? 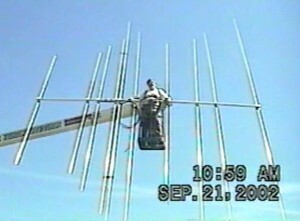 Bill of W9INN Antennas (really well-made wire antennas!) ** Bill became a Silent Key in 2004 — may his style of workmanship live on. Here is a table of windspeeds for the Trylon T600. We only put about 11 sq. ft. of antennas on ours (a Force 12 XR-5 and an M2 6M5X), and even though our area of Texas (near Dallas) in only a “70 mph” area, there’s no way we were going to even get close to pushing the limits. (To find out what windspeed you live in, click here for the Champion Radio page on this subject.) Our T600-64 should handle our antennas at 100+ MPH. Falling down is NOT an option! 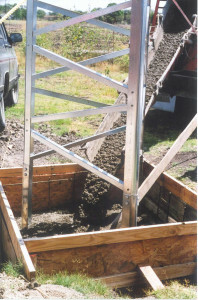 Trylon requires a 5.5′ x 5.5′ x 6.0′ flared-base hole, which is 7 cubic yards of concrete. Our hole was deeper, had bell-shaped walls in addition to the flares at the bottom, and took a hair under 10 yards of concrete. 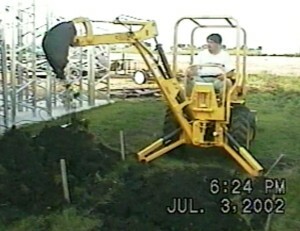 Here is Dave (N0RQ) with the Termite backhoe. Neat little machine! It is small, but dug fine, had a nice scoop on the front for moving dirt (we filled in several low spots in the yard), and because it was small, it did a good job of being fairly precise. 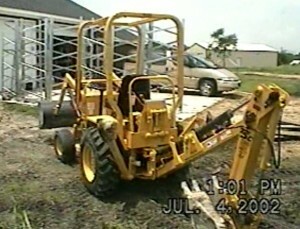 It might cost you less than hiring a guy with a backhoe — it is certainly more fun! I had never used one before, but it was easy to learn and be halfway proficient with it. This is one of the walls (upside down at the moment). For better or for worse, I put one wall in the hole at a time and put them together in the hole… easier to get them in, but makes for more work in the hole. I only used 2 walls, as the sides of the hole worked fine for the other 2 sides. As a side note, make sure to build them strong! 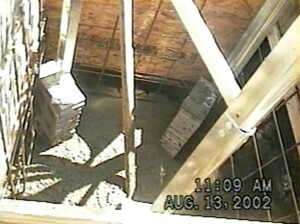 During the pour, all that concrete made mine bulge — no harm done, but we were nervous for a few minutes! Yes, the sides will cave in and dirt will slide in from the top. Yes, it takes a fair amount of shoveling! We waited for several weeks — working on the rebar cage, etc. It was longer than ideal, as we had a number of minor wall cave-ins. Oh well, we know how shovels work! Yep, the YL likes finish work. She leveled the floor (note the fan!). 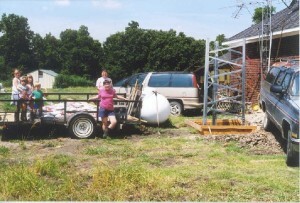 After leveling, we used a couple bags of sand, and then set the concrete blocks. Instead of staking the blocks down, we used rebar tie wire and tied all the blocks together. I don’t know which is better or if either is necessary, but when the concrete flowed (next page), we were concerned about something getting pushed out of place. Oh yeah — only put one or two blocks in for each leg — then level them — then add the remaining blocks. Not shown — the rebar cage! What a pain that thing was. I’d just as soon not remember it at all. The only good suggestion I have is to follow the Trylon specs (which we did). It only took the two of us to tip the base into the hole — not really very hard. The only tricky part was what the legs would land on. 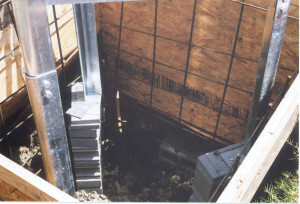 The picture below shows that we used a left-over piece of OSB, about 5′ x 4′, sitting flat on the concrete blocks. Worked great! There she is! Obviously we did not leave that sheet of wood under the legs. A skill saw quickly cut it into pieces which were then easy to remove. After the legs were sitting on the blocks, we used thin pieces of metal under the legs to level the tower. 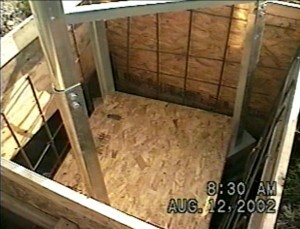 We used a good 4′ level, and put it on the top of the stubs, which are on the outside of the legs of the bottom section. I don’t know of an easier way to get it level — and being level is A Good Thing! If you’re off a little at the bottom, you’ll be off by quite a bit at the top! The finished product, ready for concrete. 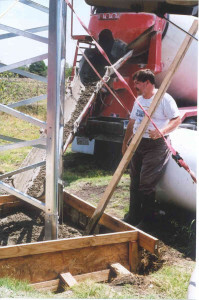 August 13, 2002: The Pour. 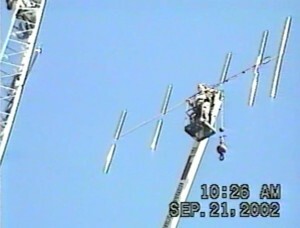 Tower was strapped down (to vehicles). One lesson learned: concrete splatters! 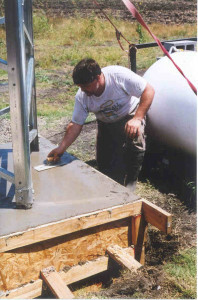 Another lesson: concrete is a lot of hard work (especially on one of those hot Texas summer days!). We used just a hair under 10 yards. Here it is with just a little concrete at the bottom. The stick in the middle was just something to push a little concrete into the corners. Don’t let the flow be too heavy, and certainly don’t let it hit the blocks — it could push something over, and then you’d have A Big Mess, A Really Really Big Mess. This makes me glad I’m a software guy, not someone that actually works for a living. Alaska doesn’t seem like such a bad place on days like this. Sweating makes you loose weight, right? Try to have the concrete right next to the stubs a little higher than the rest to keep water off of the stubs. Here are the top 7 sections, assembled, laying on the ground. It was a beautiful day for towering — mild temps, very slight breeze, pretty blue sky. It didn’t break. It didn’t bend. Crane op said it weighed about 800 pounds, which is about what we expected. 3 straps were attached 1/3 of the way down, per Trylon recommendation. Well, this part was challenging. Sometimes it is a little tricky to get one Trylon section into another, even on the ground where you can wiggle them around. It took a while to get all 3 leg pieces inside the base pieces. We ended up using a very heavy duty strap that the crane op had and put it around the bottom of the hanging portion of the tower. We cranked it tight, which speezed the legs just a little — just enough that we could convince the 3rd leg to go in (with a little help from a sledge hammer). Frankly, I can’t imagine putting up one of these things with a gin pole, one section at a time. Getting them together can be a bear! But we did it, got the bolts in, and then it stood by itself. Mike, W8CM, did a large majority of the work this day. He was a HUGE help in this whole project! Going up in the man-basket was, shall we say, challenging… but I’m glad I did it! Mostly glad anyway. 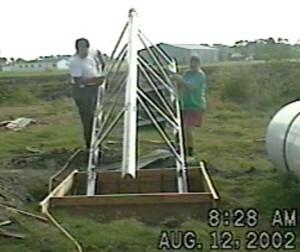 I didn’t embarrass myself (well, not too much), and the man-basket was a very effective way to get the beams up. 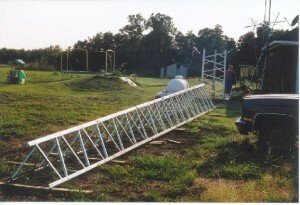 The HF beam (Force 12 XR-5) weighs 55 pounds and has an 18 foot boom. Not huge, obviously, but big enough. It rested on the side of the man-basket, went up as pictured, and rotated into place on the mast. Force 12 has a nice easy-mount system, where you don’t have to fiddle with U-bolts while hanging on to the antenna. Yes, this increased crane rental time ($), but it worked great — no ropes, no pulleys, no antenna elements banging into things, and hopefully easier for the person on the tower. 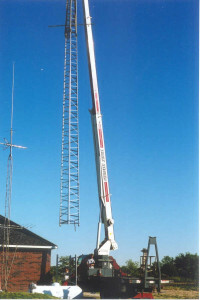 The elements rotated nicely around the crane, around the tower, and around Mike, and it was easily attached. With a little help from below from K5EEN and WA5M — getting the 2 beams lined up with each other — and then pointing them at the pre-arranged marker due north, then tightening a few bolts on the rotor, and it was set. Here is a close-up of the finished mast, HF beam, rotor (Yaesu G-1000DXA), and rotor loop (LMR-400UF ultra-flex). If the top of the tower legs look funny… the thrust bearing plate sits 6″ below the top of the legs. Trylon said I could just cut the excess off, but that seemed pretty brutal. To avoid nasty scrapes in the future, I tied on some short round pieces of excess PVC. Crude. Cheap. Effective. 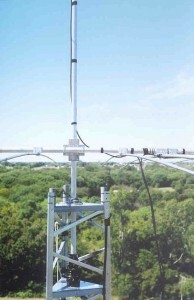 12 feet below the top of the tower (not shown) is the coax switch (5-position Ameritron RCS-8V, fed with LMR-600) and a 10′ PVC pipe (a 1″ pipe inside a 1.25″ pipe) with a pulley at each end for hanging dipoles. 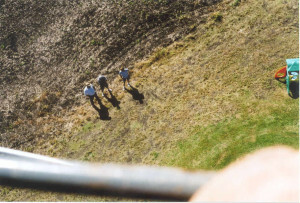 Looking down: ground crew and crane op. 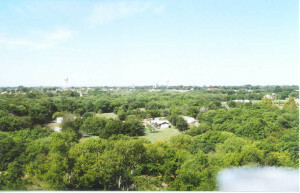 Looking S toward McKinney, Plano, Allen, and Dallas, TX. 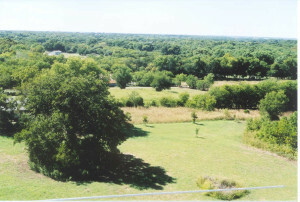 The big tree on the left is a big old (OLD) pecan. 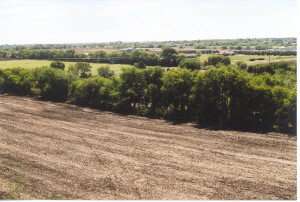 Looking SW, towards west McKinney, and much farther away, Ft. Worth. The building is our chicken/guinea house. Looking W toward the big (not!) 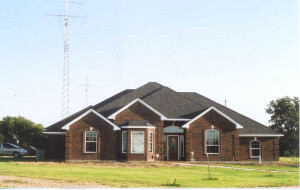 town of Melissa. 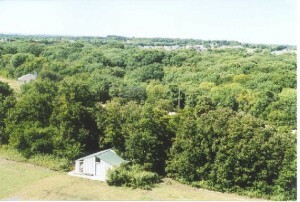 Our property is fairly high, and the ground is either even or slopes down slightly as it goes away from us. There are 2 water towers in the picture. The tan one is easily seen on the left, but the white one near the middle is harder to see. That one holds the 443.200 MHz repeater and W5MRC-15 APRS digipeater on 144.390 MHz. That’s the last picture. I hope part of this was either helpful or enjoyable for you. Page 8, the last page, has no pictures but does give some on-the-air results, comments, links, etc. Well, that’s it for pictures, but I’d like to make a few comments. First, the results. The Force 12 XR-5 at 65′ has been amazing. Well-built, good instructions — should make a lot of QSOs. We have one issue with it — the SWR at the low end of 15 meters is not good. It likes 21.5 MHz the best. By the time you get down to 21.2 MHz, the SWR is 2.0:1. Others have reported similar problems, but in all fairness, some people have no problem. I admit that it could be my error, but I don’t think so, because there is more than just a couple of guys with this problem. Email me if you want details. The internal tuner of the rig handles it fine. ZD7CY 28 St. Helena Is. VK9YL 14 Lord Howe Is. How’s that for 1 week on HF??? After almost 1 year of use, the M2 6M5X 5-element 6m beam at 70′ has been great! In 10 months of operating on 6 meters, Dave has over 300 grids worked, and Sue has around 200. That’s with 100 watts. The Trylon T600-64′ is good. Some folks have issues with them — the galvanizing before cutting, supposedly “light duty”, etc. But if you don’t overload it and install it right, I don’t see how you could go wrong. 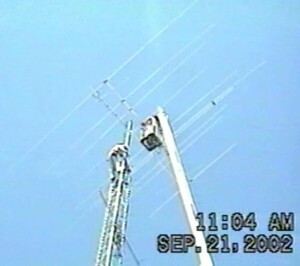 Other options, beside the obvious 3 — US Tower, Universal Tower, and Rohn — would be Heights (deluxe), AN Wireless, and Tower Depot. Comments/questions, please email us at mycallsign “at” arrl.net . THANKS FOR VISITING!